in Peru, the origin of the potato and its’ biodiversity. We are working on its’ dvelopment, its’ organic agriculture, fairtrade, the creation of product lines, design and esthetic, its’ distribution. Tika Papa has been granted with 3 international awards for the environment and development among the most prestigious in the world. 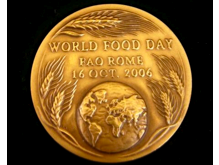 The 2006 Gold Medal of the FAO (Food and Agriculture Organisation) for food security. The NEWSWEEK & BBC WORLD CHALLENGE 2007 elected by the viewers best development project of the year. This entry was posted by admin on Wednesday, March 18th, 2009 at 12:56 pm. It is filed under Events and has these tags: Add new tag, andes, BBC WORLD CHALLENGE, development, FAO, Food security, peru, potato, SEED AWARD, tika papa, UN, UNEP. You can follow any responses to this entry through the RSS 2.0 feed. Both comments and pings are currently closed.